Good deeds should not go unnoticed. An America traveler praised a taxi driver after she got back her pouch containing P150, 000 worth of cash and valuables. Belen Zaza Swegler, 66, was grateful towards Romnick Espiritu of Peoples Network Transport for returning her pouch she left inside the taxi last Monday. The pouch reportedly contains d P50,000 cash, $2,000, credit cards, different identification cards and Iphone 8 mobile phone. According to reports from the Manila International Airport Authority-Media Affairs Division Swegler arrived at Ninoy Aquino International Airport (NAIA) Terminal 2 on board PAL flight PR-2748 from Palawan. She took the yellow taxi accredited by the airport going to Newport City Hotel in Pasay City. When she was already settled at the hotel, Swegler noticed that she no longer has her pouch. 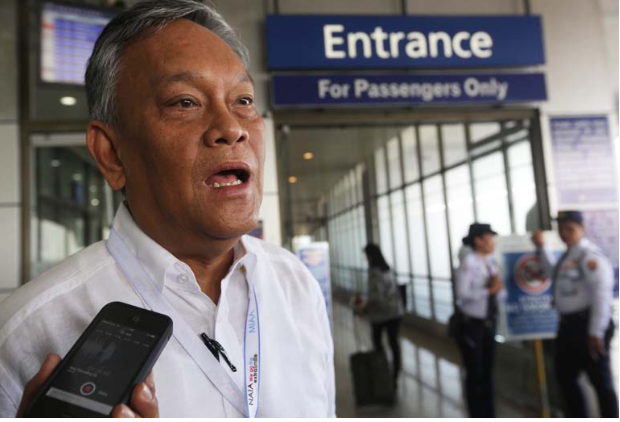 The lady went back to NAIA Terminal 2 to ask for assistance of the airport authorities, luckily, at that time, Espiritu was on his way back to Terminal 2 when he noticed the pouch inside the vehicle. The kind driver then went to the Airport Police Department where he met Swegler, who thanked him for his honesty. Swegler was ecstatic over the recovery of her belonging. She also thanked the Airport employees who have assisted her. MIAA General Manager Eddie Monreal commended Espiritu for his honesty. “I am proud to have the likes of Mr. Romnick Espiritu among the ranks of Naia-accredited taxi drivers,” Monreal said. Just few months ago, Transportation Secretary Arturo Tugade visited NAIA and personally commented airport employees and a taxi driver who have shown honesty. Tugade gave them P10,000 each as a reward for their honesty and good deeds.